2K to 10K Betting Challenge continues on Saturday evening from Wolverhampton . The betting bankroll stands at £2696 ,after Master The World won the Churchill Stakes at 6-1 for tidy £338.00 profit .Stakes now increase to £108.00 . Nice to start the All Weather season with winner ,hopefully we can increase the profits over the winter months . Moving on to Saturday we have decent looking class two handicap from Wolveserhampon. 8 runners declared for Sunracing handicap over 1M 142YDS on the tapeta at 7.45 .This looks quite competitive handicap the three main contenders look to be Original Choice ,Mythical Madness & Salute The Soldier . ORIGINAL CHOICE : 4-Y-0 Chestnut Gelding ,winning 4 out 17 .Been in fair form on turf this season ,winning class two 1m handicap at Wetherby in May,off mark 94 .Lightly raced on All Weather,though won 7f handicap at Wolverhampton back in 2017.Also finished close third in 1m handicap at Lingfield 2 weeks ago .Should be thereabouts ,though will need career best off mark 99. MYTHICAL MADNESS : 7-Y-0 Bay Gelding ,winning 7 out 53 .All three victory's on All Weather coming here at Wolverhampton .Not the most consistent sort ,though landed 1 mile class three handicap at Haydock in July .Returned to form two weeks ago, finishing close second in class two 8f handicap on All Weather at Lingfield .Looks fairly handicapped off 2lb higher mark. 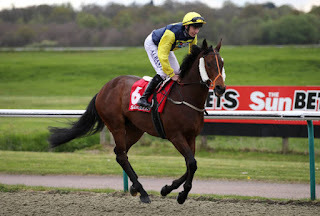 SALUTE THE SOLDIER :3-Y-0 Bay Gelding ,winning 2 out 5 .Has decent record on All Weather (211), landing two class 4 handicaps in good style ,including winning 1 mile handicap at Kempton earlier this month.Up 13lb in weights for those two recent victories.Also takes step up in class here ,though looks open to further improvement on All Weather . VERDICT :Salute The Soldier looks progressive sort ,after winning his last two starts in good style ,though odds around 15-8 look poor value for horse taking two grade hike in class,off 7lb higher mark. Three time course winner MYTHICAL MADNESS should go well,after finishing creditable second at Lingfield last time.That looked decent effort in fast time, after not getting the best of runs in closing stages .Will be suited returning to Wolverhampton over this slightly longer trip .Odds around 6-1 look solid e-way value .